Not faraway from Dubrovnik, in the middle of the Adriatic sea, the magnificent island Mljet found its place. It's the most southern and most eastern larger Croatian island, and its northwest part is also a National park – the oldest sea park on the Mediterranean, and according to many, it's also the most beautiful island on the Adriatic. The Illyrians, old Romans and the Dubrovnik Republic left on Mljet a rich cultural – historical heritage, which, including the magnificent nature and the medieval benedictian monastery were the reasons why that part of the island was made a national park back in 1960. If you're in Dubrovnik on your vacation, don't miss to go on a day trip from Dubrovnik to National park Mljet. However, if you want to extend your stay on Mljet, take a look at our offer of private accommodation and book your apartment or room on Mljet. 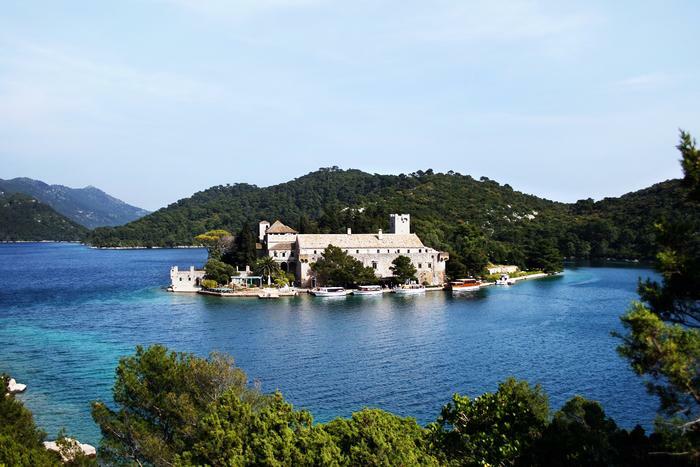 How to get to island Mljet? If you're in Dubrovnik, you can get to Mljet by a catamaran line that departs from Dubrovnik's harbour. Also, you can get to Mljet from peninsula Pelješac with a ferry that departs from Papratno and it will sail into port Sobra on Mljet. But if you're currently in Split, take a catamaran line Split – Brač – Hvar – Korčula – Mljet – Dubrovnik. Also, during summer (from June to September) you can get directly to Mljet with a ferry from Korčula. The national park is on the nortwest part of the island. There are three official entrances, and the ticket price depends on the season (it's cheapest off season and most expensive during high season). Mljet's rich cultural and historical heritage, almost intact lush mediterranean nature (the Romans called it the green island) make it a very special place for a visit, especially for those in search for an oasis of peace. Let's start from the symbol of the park, and that is the little island of st. Marie (sv. Marija) located on the southern side of Veliko jezero (lit. big lake). It's also the place where the famous 12th century benedictine monastery is located. It is to these monks we must be grateful for the greenery on Mljet. They were owners of the island for many centuries and they tended it by foresting some parts scarred by wildfires and by growing different plants. Back in antiquity, Mljet was ruled by the Romans. Traces of their rule can be found in Polače, where you can sightsee the remains of a large Roman palace. This palace is the third biggest and most preserved Roman monument on the Croatian coast of the Adriatic sea, right after the Diocletian palace in Split and the Pula Arena. Near the palace you can also check out the Roman therms and an early Christian basillica. Of the natural beauties of NP Mljet we have set aside a few interesting natural phenomenas that are quite rare in this world. For example, the system of the so called "salt lakes", especially Veliko i Malo jezero (the large and the small lake). Of course, those are not real lakes. Actually, the sea flows through a hardly visible canal into the land and thus creates a lake. Here you can even take a dip. And unlike the cold sea on the shore, here you can bath even during colder months because the water temperature stays warm (it's always around 25 Celsius degrees). You'll also be fascinated by the beauty of the geomorphological site of Zakamenica located on the south side of the national park which is special because of its amphiteatre shape made by the waves crashing into the cliff for millions of years. The National park Mljet is ideal for exploring, whether by hiking, biking, snorkeling or by riding a rented kayak or boat. However, cars are forbidden in the park, but you are free to use them on the other part of the island. Rent out a bike in Pomena or Polače, explore the lush nature around the aforementioned Veliko and Malo jezero; take a 200 meter long hike to the viewpoint Montekuc and rest while enjoying the spectacular bird view of Mljet and surrounding islands. Rent out a kayak and try to discover as many hidden coves and beaches as you can. Even the part of the island that isn't part of the national park is well worth your attention. Aside from the beautiful pebble and sandy (yes, sandy!) beaches we recommend you visit the so called Ulysses' cave named after the famous character in Homer's epic. The cave is actually a karst hollow whose celling collapsed. According to legend, it was the place where Ulysses lived for seven years with the nymphe Calypso and pined for his home and wife Penelope. However, because of the low celling of the cave, you can sightsee the cave with a boat only on fine weather.